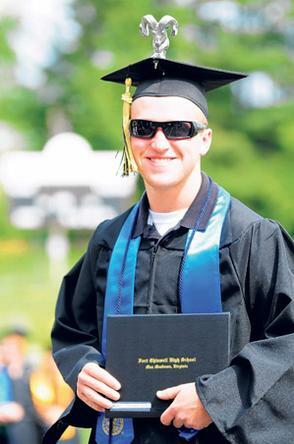 On graduation day, it is easy to blend into the masses of robed figures and mortarboards, but a high school grad in Virginia found a way to stand out and proclaim his love for Ram trucks. Robby Lyons has been a fan of Ram trucks for years. His family owns a 2004 Ram 2500 HD, and he drives a 1989 Power Ram W100 Series. When asked about his love of Rams, he says, “I sit in [my] truck and I get chills. The power and durability combined with handling – it just blows me away.” Besides owning a Ram truck, he also ran his own junior dragster up until 2009, and he plans to continue drag racing with his father and uncle, serving as the team’s mechanic. It is only appropriate then that Robby bolted a Ram head hood ornament to his graduation cap. While most people found the hood ornament amusing, some teachers raised objections to the hat. Robby was eventually given approval to wear his souped-up mortarboard to the ceremony, and since then, he has received local and national news coverage including a feature on the RamZone blog. Do you love Ram? Check out Bayside’s online inventory here, including the full line-up of Ram trucks, and keep up with the latest Ram truck news by liking Bayside on Facebook and following Bayside on Twitter!